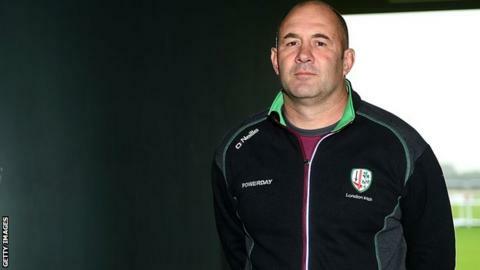 London Irish head coach Tom Coventry says his new side need to gain "respect" in the Premiership. Coventry is making final preparations ahead of his first full game in charge of the Exiles when the 2015-16 domestic season starts on 18 October. "The team I've inherited, in the competition, doesn't have a lot of respect," he told BBC Sport. London Irish, who finished 10th last season, face Leicester in their opening fixture at the Madejski Stadium. "We're about to try to make a difference in the Premiership and change that perception, so we've got a lot of work to do," Coventry added. "Over the next two weeks we'll be looking at our game stringently and making sure we continue to grow the team." London Irish completed pre-season with back-to-back defeats by Harlequins. Captain George Skivington sustained a shoulder injury at The Stoop on Friday and the lock could be a doubt for their Premiership opener. Former Samoa and Waikato Chiefs assistant coach Coventry plans to familiarise his squad with the Madejski Stadium before facing Leicester, having trained for the majority of pre-season at their Hazelwood base in Sunbury. "It's a long way from home and some of our players and coaches are yet to have a look around the place," he said. "We're going to check it out so we make sure we know where our home is. We're aptly names as Exiles and we've got a home away from home."